The Snow Goose on Sunderland Street is starting doing meals at lunchtimes from this Friday and Food4MaccDirect has been helping with the food. 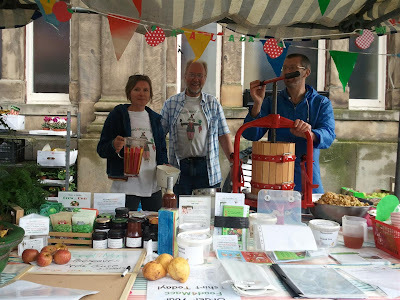 Lunch will comprise a plate of 3 Cheshire cheeses (Golden Brie, Burt’s Blue and Mature Cheshire), Cheshire sourdough, pumpkin bread or herb scone and pear chutney, all supplied by Food4MaccDirect, together with soup provided by the Snow Goose, including seasonal Cheshire vegetables. Lunch is £6.95 and will be available from noon this Friday, Saturday and Sunday. Julia Marshall's café and brasserie “Amuse” has just started using Food4Macc Direct local vegetables and sourdough bread in her lunchtime and evening menu. An example of this week’s menu is below. If you’re in Macclesfield, check out Amuse on the pedestrianised part of Chestergate! Despite the wind and rain, friday's apple pressing day outside the town hall was deemed a big success with lots of takers for free juice, freshly pressed from Macclesfield apples. Dawn MacDonald and Nancy Benson of Food4Macc's Garden Share were invited to take part in an 11 minute feature on Radio 4's Woman's Hour programme on Friday 30th September. If you missed it, you can listen to it on the BBC’s iPlayer by following this link. You can fast forward to the start of the feature by dragging the slider bar to 33mins 45 secs into the 45 minute long programme.